This was originally written as an email to Steve Kamb of Nerd Fitness who asked for travel experiences to middle america to decide where to go next. I think it turned out quite well, so I’ll post it here for all of you to enjoy. Read on for my little roundup on how to enjoy Costa Rica, what you can do, what you shouldn’t do and some good places I found. I guess we’ve had this a long time coming, but now it’s official: Plazes.com will go out of service. Thanks for being part of Plazes. We hope you enjoyed the journey, past or present. The time has come to say farewell, and next week, Plazes will go out of service. From next week, you can go to Plazes.com and move your history to Nokia Maps. Your plazes will become favourites on Nokia Maps for your PC or Mac. Shortly after next week, you’ll also be able to sync your favourites with Nokia Maps on your phone. If you like, you’ll also be able to download and save a history file containing all your activities and plazes. With Nokia Maps, you can search for interesting places and find your way there with walking, driving and public transport directions. And if you find somewhere new on your travels, you can add it to the map, write reviews, post a rating and add photos. If you have any questions, please contact Nokia Support. 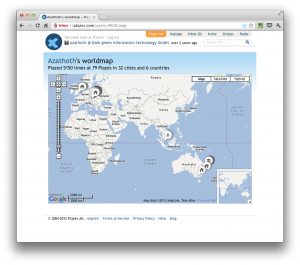 For those who don’t know; Plazes.com was a very early (I’ve became a member in early 2005) geosocial network developed in Berlin, Germany, that worked off your internet connection’s router Mac address as a location identifier. GPS or WiFi location weren’t available then. Later you could also check in via text message from your (pre-smart) phone. Other then the technicalities it was pretty similar to what foursquare is today (minus most of the gamification features). It was fun! I can remember one time, when I chased down Singapore Airport during a 30 minute stopover, just to reach the smokers lounge at the other end and connect my iBook to the free WiFi so I can score another checkin. When Nokia bought the company in 2008 I had the feeling, that development of the service pretty much stopped and eventually I too stopped using it. My last checkin was 2 years ago and that’s probably also the last time I logged on to their site. This Email today just reminded me of my account and I enjoyed looking through previous travel endavours of my former self.